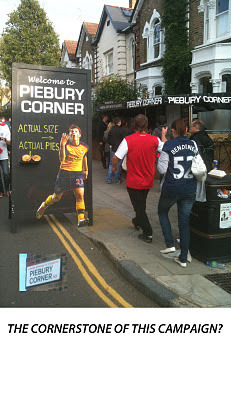 Gooner's Diary: Pie In The Sky? Regular readers won’t be surprised to hear that I contrived to miss Van Persie’s 29-second opener on Sunday. At least I had a good excuse for my tardiness, as I’d been tucking into a delicious pie. In fact it’s an appropriate reflection on our miserable campaign thus far, that the absolute highlight to date has been the discovery of Piebury Corner close to the old stadium. Time was when I’d be dashing around to the Arsenal to savour the footballing delights; whereas these days I’ve found some grub on offer outside the ground that’s far more enticing than the sort of uninspiring fare that we're fast growing accustomed to inside the stadium, which of late has been as bland (and as overpriced!) as the burgers. Mercifully on Sunday our Robin reliant set out almost singlehandedly, to serve up an aide-memoire of the sort of sumptuous feast of artistry, from the days when the Gunners would’ve been guaranteed to mullah Steve Bruce’s badly bruised Mackems. Although combined with a second-half cameo display from Arshavin, after the diminutive Ruski was sent on to try and rescue a result in the last 20 mins, such brief interludes of brilliance seem only to serve as a reminder of quite how far the mighty Gunners have fallen, when contrasted with the mediocrity of the majority of our present day play. However, having been forced to come to terms with the fact that we’ve been completely written off as a force to be reckoned with in the Premiership, it might be sacrilege to admit it, but I’m not nearly as outraged as so many of my neurotic Gooner mates. 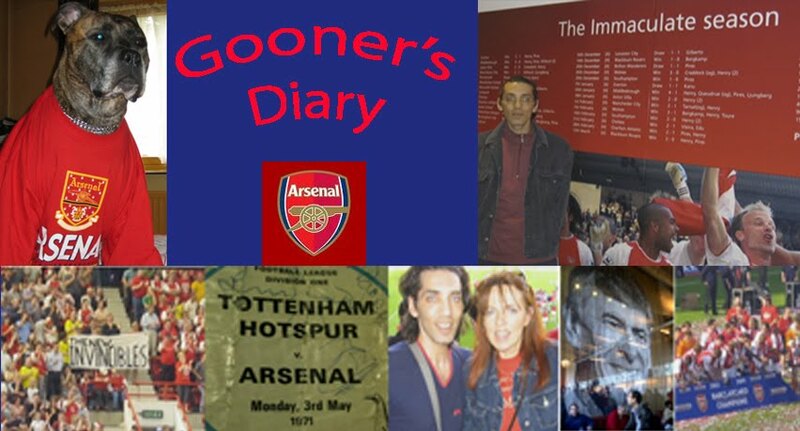 If I’m entirely honest, after six angst filled seasons of tearing my hair out in frustration with such a talented Arsenal side’s perennial failure to fulfill expectations, there’s something quite refreshing about going to games, fully prepared for the worst from such a weakened squad, only to be pleasantly surprised when they actually produce the goods. I guess that the evidence of so many empty seats and the fact that tickets are on general sale are signs that we’ve begun shaking off some of the glory-hunting chaff and there’s nothing like a spell of adversity to forge the “us against the world” sort of unifying spirit, which has been on the missing list since the Gunners became everyone’s favourite purveyors of ‘the beautiful game’. There may come a time down the road when this squad finds its feet and a return to fitness of some of our most vital components results in Arsène finally being able to field his best XI. But until then, I suspect that we’re going to have to fight tooth and nail for every point, while on the terraces we’ll be praying that our talismanic red, red Robin, keeps bob, bob, bobbing along. No longer can we afford to sit back and wait for fatigued opposition defences to part like the waters of the Red Sea, mesmerized by our mazy passing patterns. Aside from handing out written invitations to the requiem for Wengerball, with our recent inability to retain control of possession, the perception of the Arsenal as an accident waiting to happen is only going to encourage all those sides, who in the past would’ve limited their ambition to defending in numbers, merely hoping to escape our place with their dignity intact. Carl Jenkinson is a case in point. The young full-back is a long way from the finished article and there’s little doubt that the lad is going to need rescuing every now and again, so long as his trade learning efforts include such regular roastings. However, unlike Theo Walcott, who can be found aimlessly wandering around the Emirates pitch with a bewildered puss on, which suggests he doesn’t believe that grabbing games by the scruff of the neck for a struggling Arsenal side formed part of his original job description, I adore Jenkinson’s committed attitude and his willingness to run his socks off up and down the flank. Never mind Walcott giving the boy a bollicking for dereliction of defensive duties, Theo should be begging Carl for some crossing lessons! Meanwhile we’re off to Marseille, for what’s fast beginning to feel like the Arsenal’s farewell European tour. Schlepping around the Continent for so many successive seasons takes such a toll on the finances that I’ve been forced to be more circumspect about following the Gunners through the procession of the group stages. But I’m glad I had the foresight to throw caution to the wind this season, so as to be able to make the very most of our Champions Lg campaign. On the basis that our efforts to ensure an encore haven’t exactly been auspicious thus far, here’s hoping Arteta and co. can do likewise, with a tour de force in the Velodrome on Wednesday night? i know 2 man city fans and im from cork city,,,dont think the examiner will ever need as man city column thank christ! !